"Hunger Games" won the best fight, on-screen transformation and male and female performances for stars Jennifer Lawrence and Josh Hutcherson. 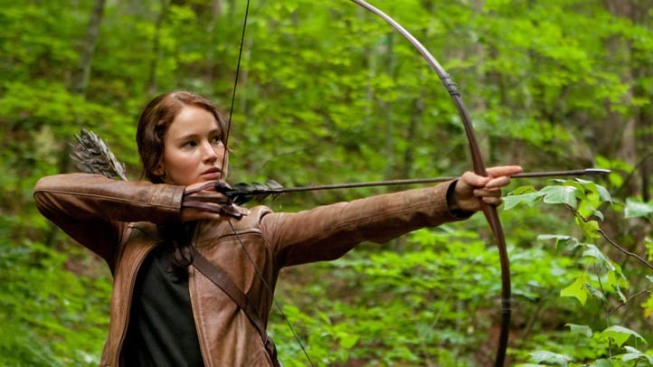 The fan votes — not just the odds — were in "The Hunger Games" favor at the MTV Movie Awards. The dystopian survival saga escaped from Sunday's 21st annual extravaganza with the most golden popcorn-shaped trophies, including best fight for the film's final three-way battle and best on-screen transformation for Elizabeth Banks' over-the-top futuristic makeover. "Hunger Games" stars Jennifer Lawrence and Josh Hutcherson were also honored for best female and male performances. "I've wanted to hold a golden popcorn since I was 4 years old," beamed Hutcherson. With four wins out of eight nominations, "Hunger Games" didn't totally decimate the competition. "Harry Potter and the Deathly Hallows — Part 2" won prizes for best cast and best hero, while "The Twilight Saga: Breaking Dawn — Part 1" won for movie of the year, and "Twilight" stars Kristen Stewart and Robert Pattinson locked the best kiss trophy for the fourth straight year. "God, Rob's not here, you guys. I don't really know what to do," said Stewart, who pretended to make out with herself. "Bridesmaids" walked away with two awards, though their wins weren't televised. The cast of the naughty comedy won best gut-wrenching performance for the scene in which the ladies battled food poisoning, and Melissa McCarthy won the best comedic performance award. Director Christopher Nolan and stars Christian Bale, Gary Oldman, and Joseph Gordon-Levitt shared an exclusive clip of “The Dark Knight Rises” for MTV audiences. It was a reminder that this summer the Batman trilogy comes to an end after almost nine years in the making. “I think Bruce Wayne’s story is one of the great stories,” said Nolan as he presented the clip. "Tonight, I'm gonna keep my eyes peeled for my next wife," joked Brand. "Fasssssbender!" In lieu of a wordy acceptance speech for his MTV Generation Award, the show's version of a lifetime achievement trophy, Johnny Depp performed with The Black Keys. Steven Tyler and Joe Perry presented the award to the 48-year-old "Pirates of the Caribbean" star, who accompanied The Black Keys on guitar for "Gold on the Ceiling" and "Lonely Boy." "It's like the get-out-of-the-business award," said Depp. Other winners Sunday included Shailene Woodley for breakthrough performance for "The Descendants," Jennifer Aniston as best on-screen dirtbag for "Horrible Bosses" and LMFAO's "Party Rock Anthem" from "21 Jump Street" for best music.